Ansonia Clock Co., Royal Bonn, "LaVogue", ca 1901. 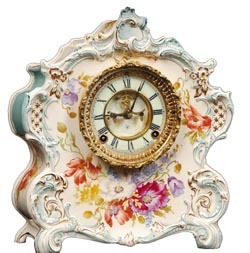 Clock is 12.75" high, 11.25" wide. Case is white with Baby Blue and gold outertrim, reds and yellows around the dial and sides. Ly-Ansonia, page 620.